The letterpress die cutting method is used for designs with a critical register of bleeds with a minimum wrap over the folds and with minimum image shift of borders or other design elements. A steel rule die is used to cut and score the sheets one-at-a-time for maximum quality control. Jobs for letterpress die cutting must be printed one up on a larger sheet size than for high die cutting. Letterpress die cutting requires a larger sheet size than high die cutting. Check the letterpress sheet size guide for the minimum size you need. A larger sheet is ok! Center the layout template on the press sheet. Grip and guide placement on the sheet is important for best cutting register. Look at the template "right reading." For standard sizes allow a minimum of 1/2" grip at the "bottom" of the template which is the edge of the sheet closest to the back panel of the envelope. Guide on either the left or right side flap. For the small open end catalog/policy sizes allow a minimum 1/2" grip on the left or right side panel edge of the template. Guide on either the seal flap "top" or end flap "bottom." For large open end catalog sizes allow a minimum of 1/2" grip at the end flap "bottom" of the template. Guide on either the left or right panel. For large open side booklet sizes allow a minimum of 1/2" grip at either the left or right side seam. Guide on the seal flap "top". Best stock weight for letterpress die cutting is 70# or 80# text with a caliper of approximately .005 to .0068 for standard sizes and up to .0085 for open-end catalogs and large open-side booklets. One-up sheets need to be cut straight, square and to the same size. Follow the grain direction requirements as shown on the layout template. Grain wrong setup charges will apply. An over run for setup and waste is required. The minimum is 300 or 10%, whichever is greater of the finished count. 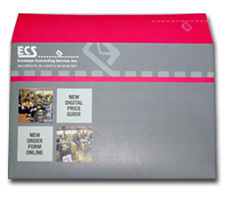 For open-side booklets and open-end catalogs allow a minimum of 400 or 10%. Letterpress Die Cutting requires a larger one-up sheet size than High Die Cutting. Check the Letterpress Sheet Size Guide for the minimum size you need. A larger sheet is ok! Letterpress jobs have best cutting register when printed one up. Best stock weight for Letterpress is 70# or 80# Text with caliper between .005 and .0068 for Standard sizes and up to .0085 for Open End Catalog and Large Open Side Booklet sizes. Grip and Guide placement on the sheet is important. Refer to Letterpress Job Checklist for more instructions.